Yesterday afternoon the Western Cape Province, the City of Cape Town , Wesgro and other supporting partners officially announced the launch of the inaugural Africa Halal Week 2018, scheduled to take place between 15 to 17 October. The Africa Halal Week will foster business linkages and conversations as well as highlight opportunities spanning across sectors including Tourism, Trade, Investment, Islamic Banking, Fashion, and Film and Media Promotion, Fashion, Cuisine, Investment and Trade opportunities in SA and Africa. The Western Cape as a Muslim-friendly Film and Media Destination. To date, 40 international buyers, CEOs and key opinion leaders operating in the global halal industry will be participating in the Africa Halal Week. 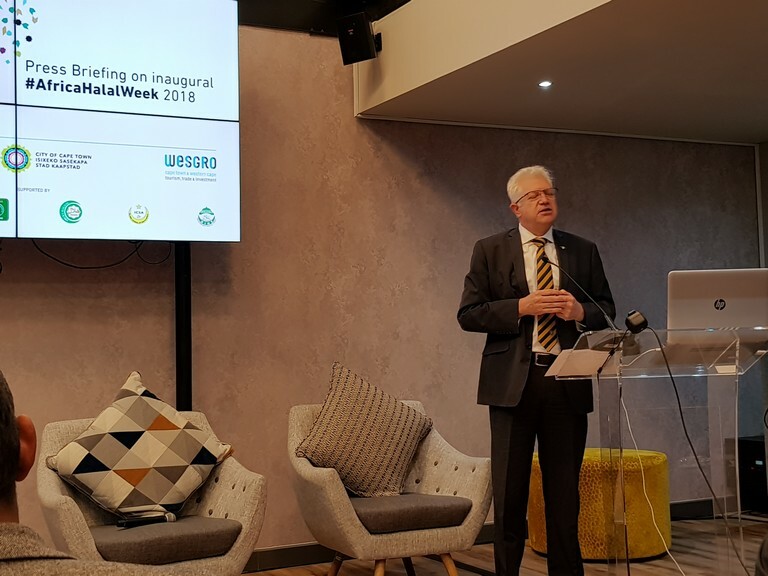 Minister of Economic Opportunities, Alan Winde, addressed media about the conceptualisation of Project Khulisa – which set out to create new jobs in the tourism and agri-processing sectors. Since 2015, a key initiative under the project has been to grow the Western Cape’s share of the Halal market from less than 1% to 2%. Wesgro’s International Trade Unit and DEDAT have been working closely with stakeholders such as the Halal Co-Ordinating Committee, Halal Certification Bodies, Export Councils and the private sector to make the event a reality. Highlighting the importance of Halal in other sectors – Wesgro CEO Tim Harris, referenced the Mastercard Halal Trip Muslim Millennial Travel Report 2017 research, that projects that the total expenditure from Muslim millennial travellers alone will surpass US$100 billion by 2025, while the overall Muslim travel segment is estimated to reach US$300 billion by 2026. “Our province is rich in history, across a multitude of religions, ethnic groups and cultures. Halal is one of the threads that reveals the tolerance of our city as well as our capabilities in delivering on the requirements of this sector. We are perfectly positioned at the Southern tip of Africa to tap into this growing consumer base and increase our capacity in the Halal supply chain, with the goal of growing the Cape’s Halal Market share,” concluded Harris. The long-term aim of this project is to position the Western Cape and SA as an important trading hub for Africa. To this end, it is hoped that the Africa Halal Week will grow and become a key trade platform on the international calendar.